Where Is Adaptation? Mapping Cultures, Texts and Contexts. Where is Adaptation? 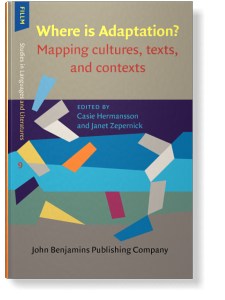 Mapping cultures, texts, and contexts explores the vast terrain of contemporary adaptation studies and offers a wide variety of answers to the title question in 24 chapters by 29 international practitioners and scholars of adaptation, both eminent and emerging. From insightful self-analyses by practitioners (a novelist, a film director, a comics artist) to analyses of adaptations of place, culture, and identity, the authors brought together in this collection represent a broad cross-section of current work in adaptation studies. From the development of technologies impacting film festivals, to the symbiotic potential of interweaving disability and adaptation studies, censorship, exploring the “glocal,” and an examination of the Association for Adaptation Studies at its 10th anniversary, the original contributions in this volume aim to trace the leading edges of this evolving field. Please note that members of FILLM's Member Associations are entitled to a 30% discount on volumes in the FILLM Book Series, FILLM Studies in Languages and Literatures.